Business conditions in 2017 are forecast to remain challenging. The outlook for insolvencies in France shows a 3% decline. However, the uncertainty surrounding the May presidential elections may impact business activity and cause slowdowns. 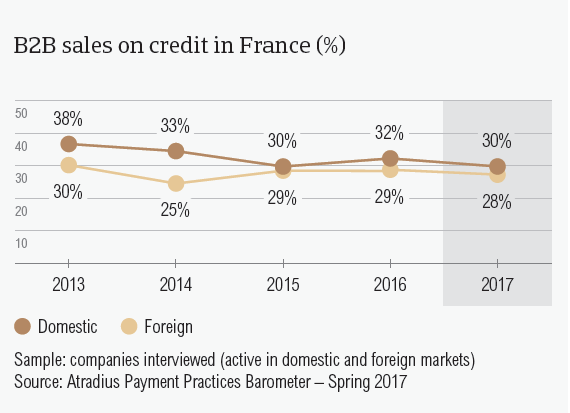 After a modest increase in the 2016 survey, the proportion of B2B sales on credit in France dropped again this year. In 2017, 29.3% of B2B sales in France were made on credit, far less than the regional average of 38.9%. This shows a similar picture to what was observed last year. Like their peers in Western Europe, respondents in France are more likely to offer credit terms to domestic B2B customers than to foreign ones. However, the proportion of domestic B2B sales on credit (30.3%) is not significantly higher than that of foreign B2B sales on credit (28.3%). This is likely to reflect an almost uniform perception of payment risk arising from domestic and foreign B2B trade. There has been a reduction in the percentage of both domestic and foreign B2B sales made on credit this year compared to the 2016 survey. Together with Germany and Austria (26.5%), Switzerland (28%) and Belgium (31.8%), France is one of the countries least inclined to sell on credit terms to B2B customers. Compared to one year ago, France has seen a decreased percentage of overdue B2B invoices. The total value of B2B receivables remaining outstanding past the due date is slightly higher than that of Western Europe. Respondents in France (85.9%) seem to have experienced late payments from their B2B customers slightly less frequently than their peers in Western Europe (87.8%). The percentage of late payments reported also declined compared to one year ago (91%) when it was in line with the regional average. Around half of the late payments in France turned into overdue invoices which remained outstanding past the due date (43.4%). This percentage is slightly higher than the regional average of 40.6%. The Days Sales Outstanding (DSO) figure in France (42 days) is almost in line with that posted at regional level (44 days). In 2017, the average DSO figure went down by eight days (the regional average decreased by four days). This may indicate more efficient collection of high value invoices. Over the next 12 months, most respondents in France (65.4%) do not expect any changes in their annual average DSO. 17.8% of respondents expect to see a minor increase, while 8.9% foresee a slight deterioration over the same time frame. In 2017, respondents in France requested faster payment of invoices from their B2B customers. France is the only country in Western Europe which has not seen an increase in payment delays from domestic B2B customers. In 2017, respondents in France asked their B2B customers to pay invoices within 34 days, on average. This average payment term is three days shorter than one year ago and may highlight French respondents’ belief that they are more exposed to risk. The average payment terms offered by French respondents is almost in line with the regional average. Respondents in Western Europe asked their B2B customers to settle their payments within 32 days. 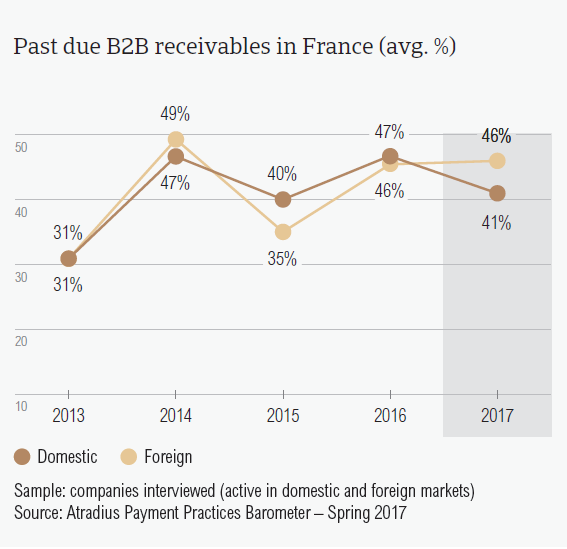 Domestic and foreign B2B customers of respondents in France were given, on average, 34 days to settle their invoices. Looking at payment delays, France was the only country in Western Europe which has not seen an increase in payment delays from B2B customers. 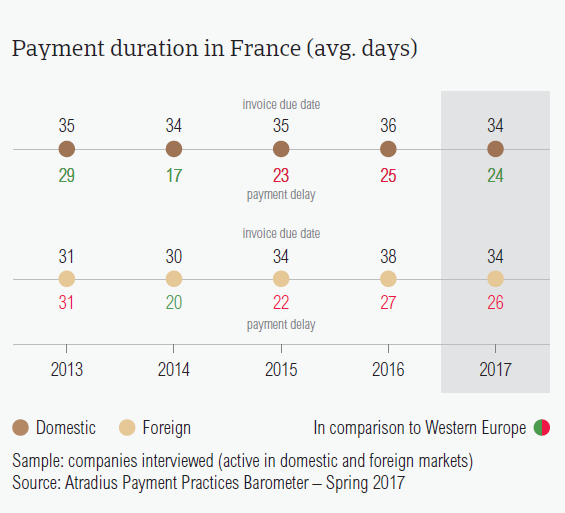 In 2017, B2B customers of respondents in France settled payments one day faster (domestic: 24 days; foreign: 26 days) than in 2016 (domestic: 25 days; foreign 27 days). It currently takes respondents in France an average of 59 days from invoicing to turn past due B2B invoices into cash. This is four days shorter than one year ago. B2B customers of respondents in France delayed payments most often because of liquidity constraints. However, this reason was stated less often than in Western Europe overall. The main reason for payment delays in France was the insufficient availability of funds. Respondents in France stated this reason more frequently in regards to their domestic B2B customers (48.4%) than their foreign B2B customers (29.1%). Liquidity constraints were also the key payment delay factor stated by respondents in Western Europe. However, the regional percentages were notably higher (domestic: 52.6%; foreign 34.5%). Domestic B2B customers of respondents in France also delayed their payments because the goods delivered or services provided did not correspond to what was agreed in their contract. This was stated by 20.3% of respondents in France. In respect to foreign B2B customers, the second most frequently cited reason for payment delay was the complexity of the payment procedure (26.2% of respondents stated this). Most respondents in France (42.3%) said that overdue invoices did not have a significant impact on their businesses. Around 18%, however, had to postpone payments to their own suppliers because of late payment by their customers. Respondents in France do not appear to be as concerned as those in Western Europe about the impact of Brexit, the slowdown in Asia and US protectionism. To protect themselves against the uncertainty caused by these events, most French respondents said they will check their buyers’ creditworthiness more frequently and increase bad debt reserves. A higher percentage of respondents in France (53.4%) than in Western Europe (48.3%) stated that they will not change their current mix of credit management tools to protect their businesses against the risks of payment defaults. 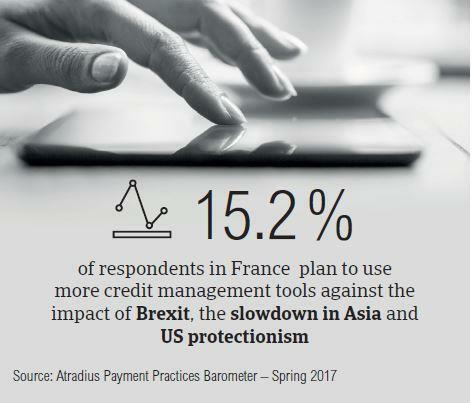 When asked about increasing the usage of credit management techniques, a lower percentage of respondents in France (15.2%) said that they plan to use more tools (Western European average 18%). Respondents in France chose the same two credit management techniques to protect themselves against the impacts of Brexit and US protectionism. They plan on checking their buyers’ creditworthiness more frequently (25% for both Brexit and US protectionism) and increasing bad debt reserves (impact of US protectionism 19.6%; impact of Brexit 14.7%). The slowdown in Asia seems to be the least likely to prompt French respondents to increase protection and use of credit management tools. 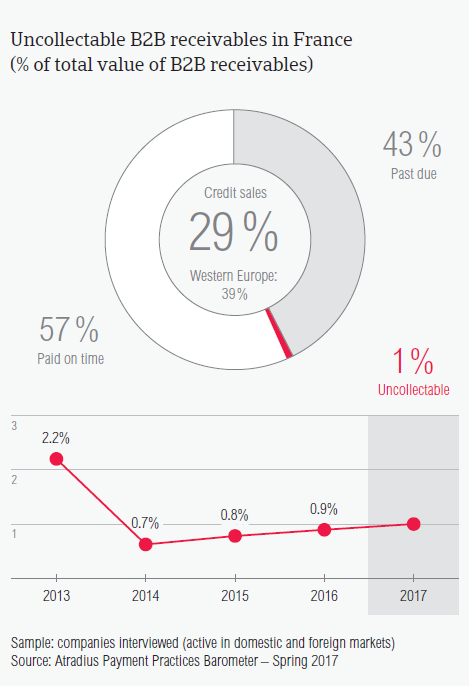 Suppliers in France reported that 0.5% of B2B receivables were written off as uncollectable. This percentage is slightly lower than that registered in Western Europe overall (0.6%). Domestic receivables were written off as uncollectable four times more often than foreign ones (domestic 0.8%, foreign 0.2%). However, the proportions of uncollectables in France were below the regional averages (domestic 1%, foreign 0.3%). Uncollectable B2B receivables originated most often from the construction, consumer durables and business services sectors. The main reasons why B2B receivables were uncollectable were the customer’s bankruptcy (51.5%) and the debt being too old (26.9%). 20.6% of respondents in France also reported the high costs of pursuing debtors as an important reason for write-offs. 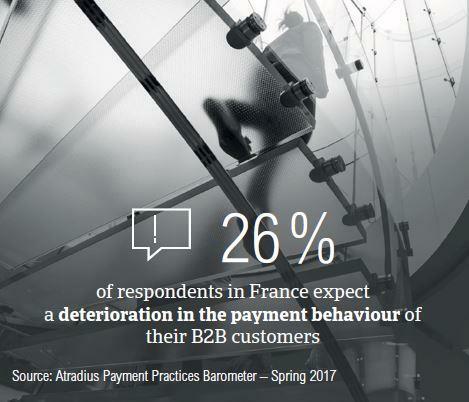 Most respondents in France do not expect changes in the payment behaviour of their B2B customers over the coming 12 months. However, 26% expect payment behaviour to worsen. Respondents in France extended notably longer payment terms than the 34 days country average to B2B customers in the transport (49 days), metals (47 days) and machines (44 days) sectors. The shortest payment terms were given to B2B customers in the agriculture sector (7 days). B2B customers in the agriculture sector took the longest to settle their payments (74 days. The most frequently cited reason for the payment delays was the buyers’ use of outstanding invoices as a form of financing (stated by 67% of French respondents). 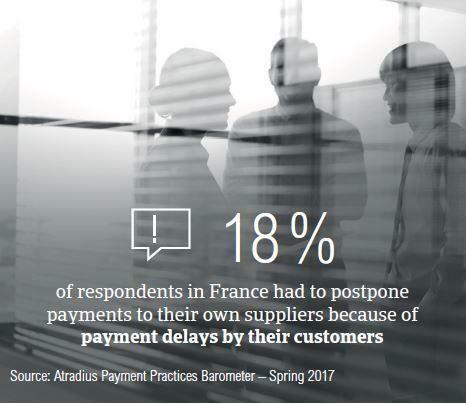 33% of respondents in France also stated that payments have been postponed because of the formal insolvency of the buyer and due to the complexity of the payment procedure. Consistent with the view expressed at regional level (58%), most respondents in France (55%) don’t expect changes in the payment behaviour of their B2B customers over the next 12 months. More respondents (26%) expect deterioration in the payment behaviour of their B2B customers over the same time frame than expect improvement (15%).